Who says women can’t defuse a mine? Galina Slesareva is Russia's only female sapper. She serves in one of the units of the Russian Emergencies Ministry's Kaluga Region directorate in Obninsk. "I didn’t choose this profession. It chose me!" said Slesareva. "In my youth, I developed a passion for search work in the woods. On my way, I frequently encountered mines and other explosives left over from World War II. So I had no other choice but to train to be a sapper to continue doing things I loved." Today, male colleagues appreciate Slesareva's professional qualities, but at the beginning of her career, she had to deal with blatant male chauvinism. "In the beginning, the men had a standard reaction – 'What can a woman defuse?!' or 'No one will work with her,'" said Slesareva. Where do women stand in Russia’s armed forces in the 21st century? "However, after working with me for a while, they changed their opinion – 'we are not afraid when we are with you.' Women have a greater instinct for self-preservation, which is very important for the deminer." Over the years, she has defused thousands of explosives. Slesareva is always at the ready, because she can be called for service at any moment. "The calls are different," she said. "There are very scary and unpredictable situations. But the understanding of fear comes only after the job is done. " Slesareva is married. She loves to sew, knit and cook, and is fond of history. 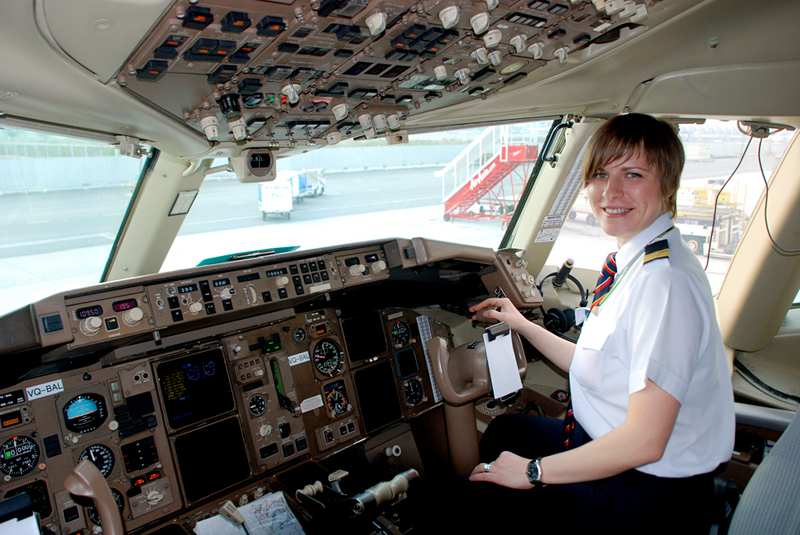 Vera Maximova works as a Boeing 767 co-pilot for Aeroflot. Ever since she was young, Maximova dreamed of becoming a pilot, even though no one in her family was associated with aviation. In the late 1990s, when she wanted to go to flight school, it just did not accept girls. So she enrolled at the Pedagogical University, but she could not give up her dream of flying. After graduation, she tried to enter an aviation college again. To do this, she had to obtain special permission, be examined by a medical commission and pass a lot of exams. "To enroll for a pilot training program was the most difficult challenge of my career," said Maximova. For more than two years, Maximova worked for the Mirny airline in the Far East of Russia. It was only then she got a job in Moscow. "For Russia, a woman pilot – this is unusual. Passengers are usually very surprised, but it's a pleasant surprise," said Maximova. The situation with male colleagues is more difficult, however. "You know how many how many jokes there are about women driving, but if you are a woman pilot, the pressure from men increases a hundred times," explained Maximova. "But I do not ask for favors and concessions. When you work with men for a while, they begin to understand who you are and what you can do. Then their attitude changes, but it takes time." Maximova is married with two children. In her spare time she enjoys photography and sports. For more than a year, Novikova has served as an attaché at the Russian Embassy in Djibouti and Somalia (part-time). She is the only woman diplomat at the embassy. "I wanted my life to be in diplomacy since the age of reason, as I have always been interested in other cultures, a different way of life and foreign languages," said Novikova. After high school, she enrolled at MGIMO (the Moscow State Institute of International Relations). During six years of study, it was a normal thing for her to sleep 1.5-2 hours a night. Nevertheless, her knowledge proved useful – Novikova is fluent in six languages. What is it like to be a man on International Women’s Day? Djibouti has no theaters, galleries or cinemas. For eight months of the year, the temperature is not lower than 45 degrees centigrade in the shade. "Since the country is tiny, when I say that I work in Djibouti, the first question is 'Where is it? Is this a country or a city? Can you walk outside or will they eat you there?'" says Novikova. "When you talk about Somalia, people roll their eyes in surprise and ask, 'Have you seen the pirates? Do you wear bulletproof vests?'" The diplomat usually replies that she walks the streets of Djibouti without fear, has not seen Somali pirates and does not wear a bulletproof vest. While women often show support for Novikova, men are more skeptical. "There is still gender bias in our society, and many still believe that diplomacy (and even work in Africa) is not for women," she says. "It seems to me that the main difficulty of the profession is in these prejudices." In her free time, Novikova works on her thesis and teaches English to a seven-year-old child of one of the embassy staff. She enjoys sewing clothes and plays the piano.